Show off your investments with our display stands. These treasures will shine when treated with quality products designed for use on our line of weapons and armor. Groom / Stick® is a novel form of natural rubber with specific properties combining to create a surface dry-cleaner of high efficiency. Pre-Lim is a paste designed for non-scratch stain removal, cleaning and freshening of many surfaces, especially metals and enamels. Produces a silky, smooth finish. This de-corroder is a safe, non-toxic system for rust removal on iron, bronze, copper and copper alloys, brass, steel, zinc, and galvanized materials. Also cleans rusty water stains. This wax polish from England restores, refreshes and protects antiques, cutlery, furniture, precious metals, armory, collectibles, art, photography, and much more. This liquid soap is a safe, non-foaming, acid-free and germicidal cleaner for everything from paper to stone. Must be mixed with water or solvent prior to use. Good product. Using it on all my weapons collection. The cloth is excellent, and the wax easy to apply. I followed the easy directions and the results were good. I would buy again when my can runs out. 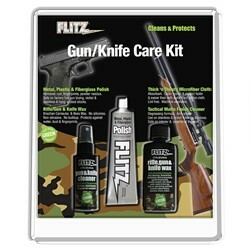 I use this all the time on my swords, axes, and firearms and my wife doesn’t hate the smell of it so I can clean and oil in the house without complaint! 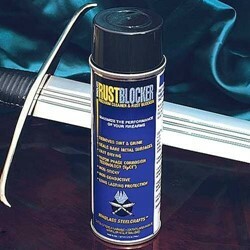 There are a lot of rust blockers, but this is a great option. Grab a can (or two) to help you maintain the classic look of your steel-based products.